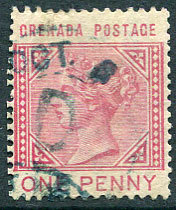 arrival on KE7 1d (SG.71), creased corner. on QV 2d CC wmk (SG.9a). 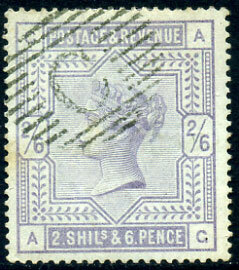 on 1883-84 GB QV 2/6d lilac/blued paper (SG.Z142, Cat.£750), slight toning blemish. 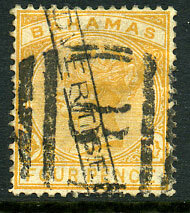 on QV ½d CC wmk (SG.7a). 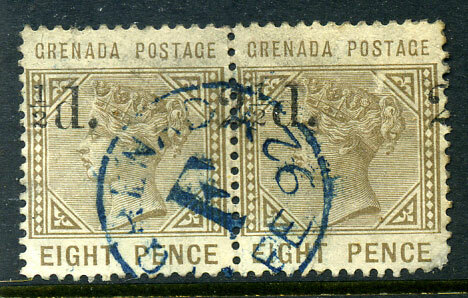 on KE7 ½d MCA wmk (SG.148), facially scuffed top right corner. on QV 2d CC wmk (SG.9). on QV 1d CA wmk (SG.17). 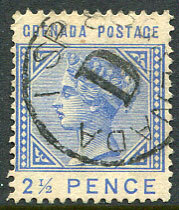 on QV 4d CA wmk (SG.22b), small thin. on QV 2d Keyplate (SG.28). 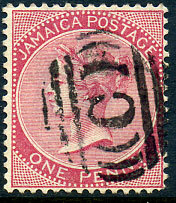 on QV 1d CA wmk (SG.18), rare on this. on QV ½d CA wmk (SG.16a), tears on three sides. 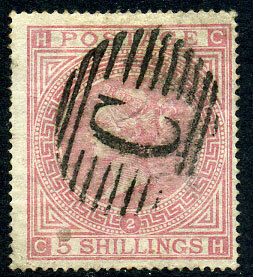 on GB QV 5/- rose Plate 2 (SG.Z121), light horiz. crease. on QV 4d (SG.53) with B oblit.